Rules designed to stop families in England taking term-time holidays are also preventing some children taking external dance, drama and music exams in school hours, says an exam body. The Royal Academy of Dance (RAD) says schools too often refuse permission to attend its exams even if pupils will only be away for a couple of hours. Ministers say they support pupils taking arts exams in school hours. But RAD says the position is confusing and wants the guidance made clearer. Since 2013, official guidance on term-time leave has said authorised absences should only be granted in "exceptional circumstances". 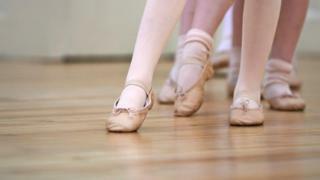 The RAD says this has caused problems for its own ballet examinations and is also an issue for children taking dance, drama and music exams with some other boards. According to RAD exams director Andrew McBirnie, before 2013 ballet exams could be run "during the school day and the student was able to leave a class at say 10 o'clock, do their exam and be back by lunchtime - and that seemed to be a perfectly legitimate activity that the student might be doing as part of their all-round education. "Increasingly over the last few years... there have been more and more schools saying: 'No we can't allow this any more because of this issue with unauthorised absence.'" In a recent letter to Ed Vaizey MP, England's education secretary Damian Hinds, said the government expected schools to be sympathetic to requests for leave to take these exams. "As long as they are satisfied that time away from school will not have a negative effect on a child's education." But the letter also says the Department for Education does not explicitly state what constitutes an exceptional circumstance. "These decisions are best made by head teachers who will know their pupils' individual circumstances best." In response, Mr Vaizey said: "The supportive stance from Damian Hinds is hugely welcome - but greater clarity is still needed. "I will continue to work with RAD on the issue and will write to the Minister for Education regarding new guidelines for schools"
Mr McBirnie welcomed Mr Vaizey's dialogue with Mr Hinds and hopes it will help persuade more heads to allow pupils to attend performing arts exams in school hours. However, he says the message is still mixed "between what the guidelines say and the mood music" from ministers. "There is no definition or further guidelines about what "exceptional circumstances" means at all. So it totally comes down to the interpretation of that phrase which is very vague. "What's exceptional for one head teacher might not be exceptional for another and to be honest leaving school for a dance exam is not exceptional, it's actually quite routine that children leave to take a dance or drama exam outside school and then come back." Ideally, Mr McBirnie says he would like examples of activities where schools would be expected to authorise absence added to the guidance. The National Association of Head Teachers said authorising absences was "difficult territory for schools because they are so severely held to account for attendance figures". Deputy General Secretary, Nick Brook, agreed that "in truth external arts exams are not exceptional circumstances, they are a well understood everyday element of school life. "A list of approved activities risks creating unnecessary tension. "What's important is that as long as the school is satisfied that time away will not have a negative effect on a child's education, absence to attend an external exam should be reason enough." Term-time holiday: What are the rules?